Why manage machines with Azure Automation State Configuration? 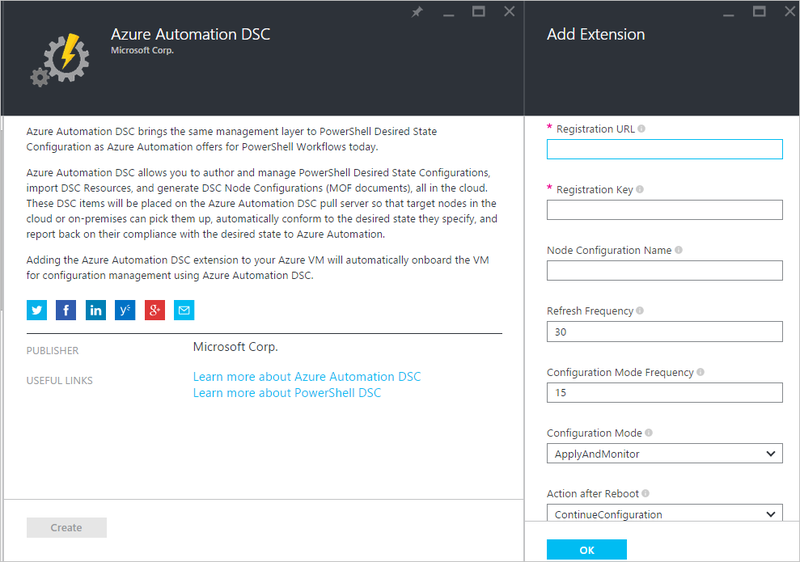 Azure Automation State Configuration is a configuration management service for DSC nodes in any cloud or on-premises datacenter. It enables scalability across thousands of machines quickly and easily from a central, secure location. You can easily onboard machines, assign them declarative configurations, and view reports showing each machine's compliance to the desired state you specified. The Azure Automation State Configuration service is to DSC what Azure Automation runbooks are to PowerShell scripting. In other words, in the same way that Azure Automation helps you manage PowerShell scripts, it also helps you manage DSC configurations. To learn more about the benefits of using Azure Automation State Configuration, see Azure Automation State Configuration overview. In addition, if you are not ready to manage machine configuration from the cloud, Azure Automation State Configuration can also be used as a report-only endpoint. This allows you to set (push) configurations through DSC and view reporting details in Azure Automation. Managing Azure VMs with State Configuration is included at no extra charge if the virtual machine DSC extension installed is greater than 2.70. Refer to the Automation pricing page for more details. The following sections outline how you can onboard each type of machine to Azure Automation State Configuration. Azure Automation State Configuration lets you easily onboard Azure virtual machines for configuration management, using either the Azure portal, Azure Resource Manager templates, or PowerShell. Under the hood, and without an administrator having to remote into the VM, the Azure VM Desired State Configuration extension registers the VM with Azure Automation State Configuration. Since the Azure VM Desired State Configuration extension runs asynchronously, steps to track its progress or troubleshoot it are provided in the following Troubleshooting Azure virtual machine onboarding section. In the Azure portal, navigate to the Azure Automation account where you want to onboard virtual machines. On the State Configuration page and the Nodes tab, click + Add. Select an Azure virtual machine to onboard. If the machine does not have the PowerShell desired state extension installed and the power state is running, click Connect. Under Registration, enter the PowerShell DSC Local Configuration Manager values required for your use case, and optionally a node configuration to assign to the VM. Azure virtual machines can be deployed and onboarded to Azure Automation State Configuration via Azure Resource Manager templates. See Server managed by Desired State Configuration service for an example template that onboards an existing VM to Azure Automation State Configuration. If you are managing a Virtual Machine Scale Set, see the example template VM Scale Set Configuration managed by Azure Automation. The Register-AzureRmAutomationDscNode cmdlet can be used to onboard virtual machines in the Azure portal via PowerShell. The best way to register virtual machines from other Azure subscriptions is to use the DSC extension in an Azure Resource Manager deployment template. Examples are provided in Desired State Configuration extension with Azure Resource Manager templates. To find the registration key and registration URL to use as parameters in the template, see the following Secure registration section. With Azure Automation State Configuration, you can easily onboard Azure virtual machines (classic) for configuration management using either the Azure portal, or PowerShell. 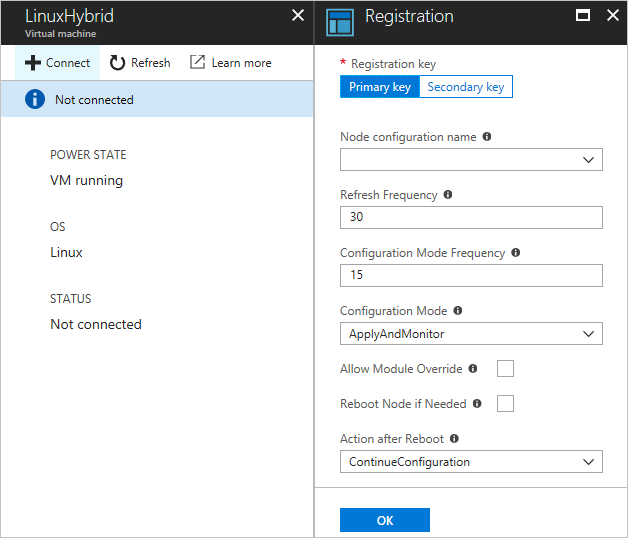 Under the hood, and without an administrator having to remote into the VM, the Azure VM Desired State Configuration extension registers the VM with Azure Automation State Configuration. Steps to track progress or troubleshoot it are provided in the following Troubleshooting Azure virtual machine onboarding section. In the Azure portal, click Browse -> Virtual machines (classic). Select the Windows VM you want to onboard. On the virtual machine's dashboard blade, click All settings -> Extensions -> Add -> Azure Automation DSC -> Create. Enter the PowerShell DSC Local Configuration Manager values for your Automation account's registration key and registration URL, and optionally a node configuration to assign to the VM. # NOTE: DSC Node Configuration names are case sensitive in the portal. # update these PowerShell DSC Local Configuration Manager defaults if they do not match your use case. State Configuration Node Configuration names are case sensitive in the portal. If the case is mismatched the node will not show up under the Nodes tab. You can easily onboard Amazon Web Services virtual machines for configuration management by Azure Automation State Configuration using the AWS DSC Toolkit. You can learn more about the toolkit here. Make sure the latest version of WMF 5 is installed on the machines you want to onboard to Azure Automation State Configuration. Follow the directions in following section Generating DSC metaconfigurations to generate a folder containing the needed DSC metaconfigurations. If you cannot apply the PowerShell DSC metaconfigurations remotely, copy the metaconfigurations folder from step 2 onto each machine to onboard. Then call Set-DscLocalConfigurationManager locally on each machine to onboard. Using the Azure portal or cmdlets, check that the machines to onboard now show up as State Configuration nodes registered in your Azure Automation account. Make sure the latest version of PowerShell Desired State Configuration for Linux is installed on the machines you want to onboard to Azure Automation State Configuration. To find the registration key and registration URL for your Automation account, see the following Secure registration section. If the PowerShell DSC Local Configuration Manager defaults do not match your use case, or you want to onboard machines such that they only report to Azure Automation State Configuration, follow steps 3 - 6. Otherwise, proceed directly to step 6. Follow the directions in the following Generating DSC metaconfigurations section to generate a folder containing the needed DSC metaconfigurations. The machine this command is run from must have the latest version of WMF 5 installed. Using the Azure portal or cmdlets, check that the machines to onboard now show up as DSC nodes registered in your Azure Automation account. To generically onboard any machine to Azure Automation State Configuration, a DSC metaconfiguration can be generated that tells the DSC agent to pull from and/or report to Azure Automation State Configuration. DSC metaconfigurations for Azure Automation State Configuration can be generated using either a PowerShell DSC configuration, or the Azure Automation PowerShell cmdlets. DSC metaconfigurations contain the secrets needed to onboard a machine to an Automation account for management. Make sure to properly protect any DSC metaconfigurations you create, or delete them after use. Open the VSCode (or your favorite editor) as an administrator in a machine in your local environment. The machine must have the latest version of WMF 5 installed. Copy the following script locally. This script contains a PowerShell DSC configuration for creating metaconfigurations, and a command to kick off the metaconfiguration creation. Fill in the registration key and URL for your Automation account, as well as the names of the machines to onboard. All other parameters are optional. To find the registration key and registration URL for your Automation account, see the following Secure registration section. If you want the machines to report DSC status information to Azure Automation State Configuration, but not pull configuration or PowerShell modules, set the ReportOnly parameter to true. Open the PowerShell console or VSCode as an administrator in a machine in your local environment. Machines can securely onboard to an Azure Automation account through the WMF 5 DSC registration protocol, which allows a DSC node to authenticate to a PowerShell DSC Pull or Reporting server (including Azure Automation State Configuration). The node registers to the server at a Registration URL, authenticating using a Registration key. During registration, the DSC node and DSC Pull/Reporting server negotiate a unique certificate for this node to use for authentication to the server post-registration. This process prevents onboarded nodes from impersonating one another, such as if a node is compromised and behaving maliciously. After registration, the Registration key is not used for authentication again, and is deleted from the node. You can get the information required for the State Configuration registration protocol from Keys under Account Settings in the Azure portal. Open this blade by clicking the key icon on the Essentials panel for the Automation account. Registration URL is the URL field in the Manage Keys blade. Registration key is the Primary Access Key or Secondary Access Key in the Manage Keys blade. Either key can be used. For added security, the primary and secondary access keys of an Automation account can be regenerated at any time (on the Manage Keys page) to prevent future node registrations using previous keys. Azure Automation State Configuration lets you easily onboard Azure Windows VMs for configuration management. Under the hood, the Azure VM Desired State Configuration extension is used to register the VM with Azure Automation State Configuration. Since the Azure VM Desired State Configuration extension runs asynchronously, tracking its progress and troubleshooting its execution may be important. Any method of onboarding an Azure Windows VM to Azure Automation State Configuration that uses the Azure VM Desired State Configuration extension could take up to an hour for the node to show up as registered in Azure Automation. This is due to the installation of Windows Management Framework 5.0 on the VM by the Azure VM DSC extension, which is required to onboard the VM to Azure Automation State Configuration. To troubleshoot or view the status of the Azure VM Desired State Configuration extension, in the Azure portal navigate to the VM being onboarded, then click Extensions under Settings. Then click DSC or DSCForLinux depending on your operating system. For more details, you can click View detailed status. After registering, each node automatically negotiates a unique certificate for authentication that expires after one year. Currently, the PowerShell DSC registration protocol cannot automatically renew certificates when they are nearing expiration, so you need to reregister the nodes after a year's time. Before reregistering, ensure that each node is running Windows Management Framework 5.0 RTM. If a node's authentication certificate expires, and the node is not reregistered, the node is unable to communicate with Azure Automation and is marked 'Unresponsive.' Reregistration performed 90 days or less from the certificate expiration time, or at any point after the certificate expiration time, will result in a new certificate being generated and used. To change any PowerShell DSC Local Configuration Manager values that were set during initial registration of the node, such as ConfigurationMode. Currently, these DSC agent values can only be changed through reregistration. The one exception is the Node Configuration assigned to the node -- this can be changed in Azure Automation DSC directly. Reregistration can be performed in the same way you registered the node initially, using any of the onboarding methods described in this document. You do not need to unregister a node from Azure Automation State Configuration before reregistering it.